In 'Trainspotting', (1993) Irvine Welsh presented a series of shocking tales that are as loosely linked as the chaotic days and nights of his characters, young people whose motivation and identity are dominated by heroin. This evocation of life in a 'peripheral' Edinburgh housing scheme, where people's lives are multiply marginalised, captures late-20th-century Edinburgh working-class dialect with unprecedented authenticity and vitality. 'Trainspotting' morphed from book to film to play, gaining international attention and acclaim. It was followed by 'The Acid House' (1994), three short stories set in clubland drug culture, 'Marabou Stork Nightmares'> (1995) a bleak look at the male psyche, 'Ecstasy' (1996), and 'Filth' (1998). Welsh exercised his feel for dramatic dialogue with the stage play 'You'll Have Had Your Hole'. In a return to the novel form, 'Glue' (2001) tracks how four wide lads out-radge each other into middle age. 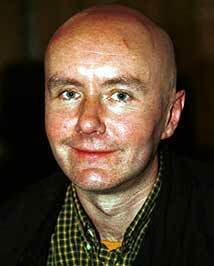 At the core of Irvine Welsh's writing there is an urgent moral sense. In language that is obscene in conventional terms he implies that the conventions of respectability mask far greater obscenities.